This cabinet was designed to meet our customers requirements of being either freestanding or wall mounted and with the main purpose of dispensing drink into a shot glass while at the same time disguising the bottle and the amount left in the bottle. 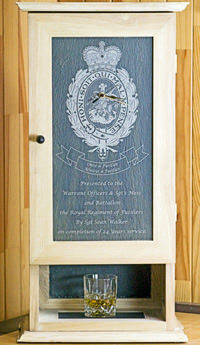 The front door includes the regimental coat of arms, clock movement and presentation details. The cabinet was manufactured from natural ash with Killaloe slate panels on back and sides matching the engraved slate on the front. 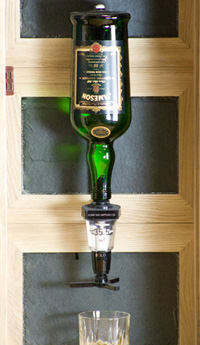 Inside the cabinet is a conventional bottle holder and dispenser. We welcome enquiries for similiar (or totally different) products. This product is suitable for many occasions eg new home, wedding, retirement or significant birthday. Irish Gift Solutions received an unusual request to make a special housing for a commemorative penny from the First World War. The penny was received by the family in honour of service by the young Irishman. The customer was particularly interested in using Bog Wood for this piece as she felt the quality and texture of the wood would serve to enhance the importance of the penny. 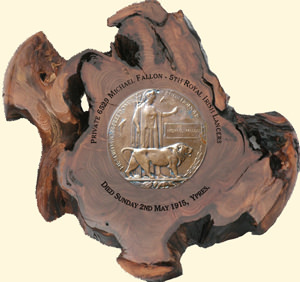 Together with the customer we carefully chose the right piece of Bog Wood to hold such a precious memento of our history. Each person will see a different shape when they look at a piece of wood, but we all saw Co. Mayo when we looked at this particular piece. The rugged edges of the wood reflect the coastline and a carefully measured circular area was cleared to house the coin. If you have an usual idea for a gift contact us via email or on 0872555391, we will be delighted to work with you on your project.